What Are the Scents Cats Hate? Many plants have scents cats hate. There are some smells that cats just hate. You may want to avoid these smells or use them to your advantage. 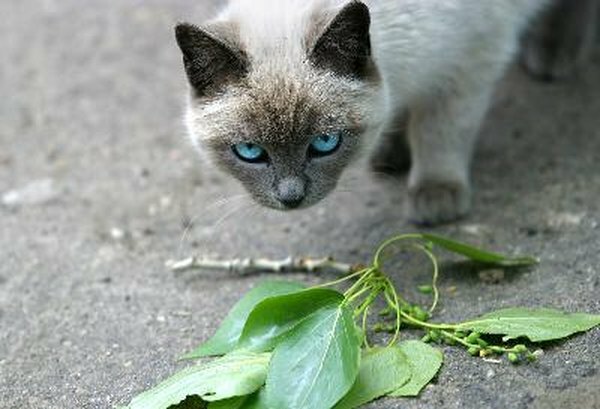 Utilize scents to keep kitty out of your new houseplant or to save your favorite sofa from being scratched. Lemons, limes and oranges are all scents that cats hate. For an easy way to use these smells around the house, try a dab of orange oil. If you are trying to deter cats from coming into your garden, try scattering your discarded orange peels throughout the area. Cats also hate the flavor of citrus fruits, so you can use it to discourage them from chewing on things. There are some natural cat litters on the market that are made with materials such as pine. However, sometimes the strong scents of these plants can bother sensitive cats. Using a litter with a more neutral scent will avoid problems with your pets. This is not a universally disliked smell, and you may find some cats perfectly willing to chew on the Christmas tree because of that. Most animals have natural aversions to scents because the plants are toxic. One clear example of this is eucalyptus. The essential oils in eucalyptus can be toxic to both cats and dogs. This powerful smell reminds many people of medicine as well, so it may not be the best choice for training your pets to avoid certain places. Wintergreen can be an intense scent for anyone, and cats in particular do not like it. Wintergreen is a flavoring used in many products, from gum to cocktails. You can soak a cotton ball with the oil and leave it in the area you are trying to keep the cats away from. Cat Training: What Are the Smells That Cats Hate? Kimberly A. Smith has been a freelance writer for two years. She graduated from the University of California at Davis and the California Culinary Academy, then pursued a career baking wedding cakes. During her time at CCA, she received certification in nutrition and food safety. She currently attends the University of Oregon School of Law. Do Cats Dislike the Smell of Mint? What Textures Do Cats Not Like?